De Tuinen is a health shop chain that I visit often. I buy some food there and stock up on raw protein powder when they have a good deal on. They also do homeopathic medicine as well as hair and body care. I had yet to try their skincare range and when I stumbled upon a 50% off deal on their brand name eye serum, I decided to give it a go. Lo and behold: it’s a success! 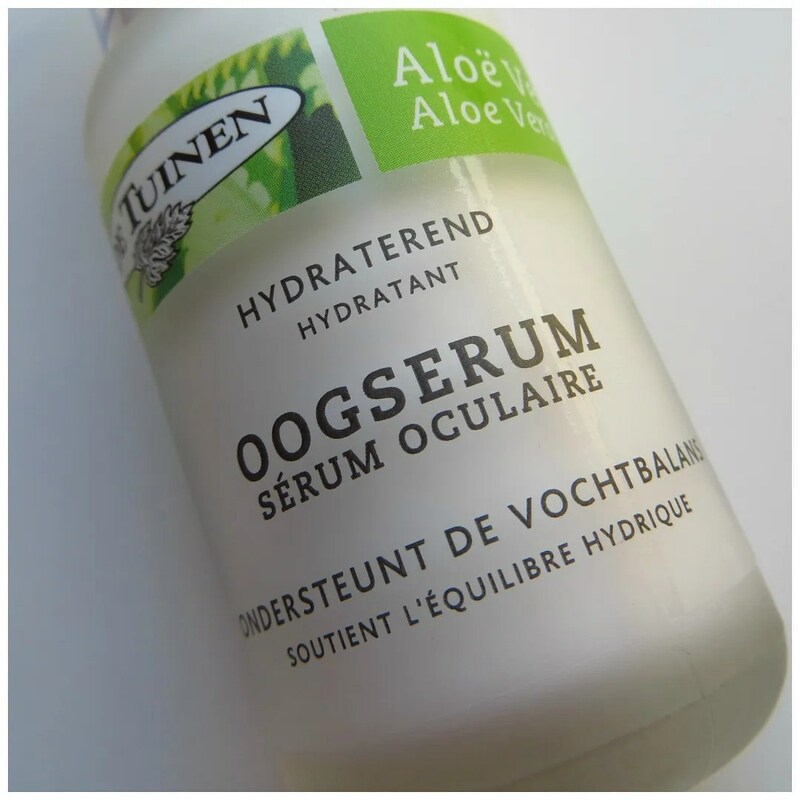 The Aloe Vera Hydrating Eye Serum was not something I found easily. After my little mishap with The Body Shop Drops of Youth Eye Concentrate, my eye area was in for something hydrating and soothing. 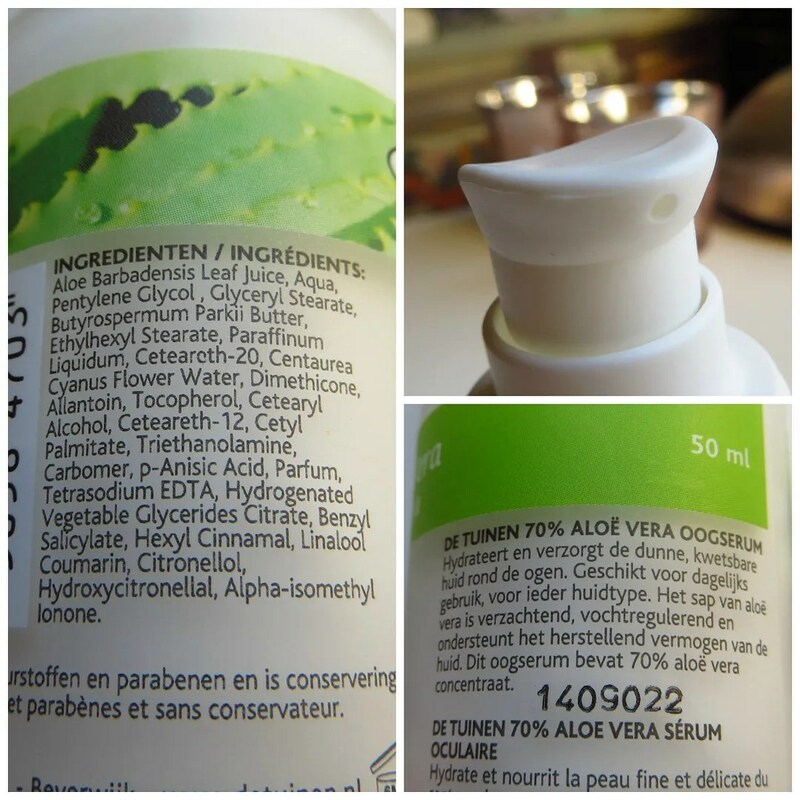 I have good and bad experiences with aloe vera skincare products. For some brands it’s a holy grail for my skin, for some brands it is complete utter agony. It really depends on the composition of the product whether my skin likes it or not. At €5,79 (€11,59 full price), I decided it was worth a gamble. It is currently on sale again by the way, so if my review peeks your interest, then make sure to check it out. The first that is great about this product is that it comes with a lot of content. This bottle contains 50 ml. That is as much as a regular day cream and since you need far less eye cream than day cream, one of these bottles will last you a life time. 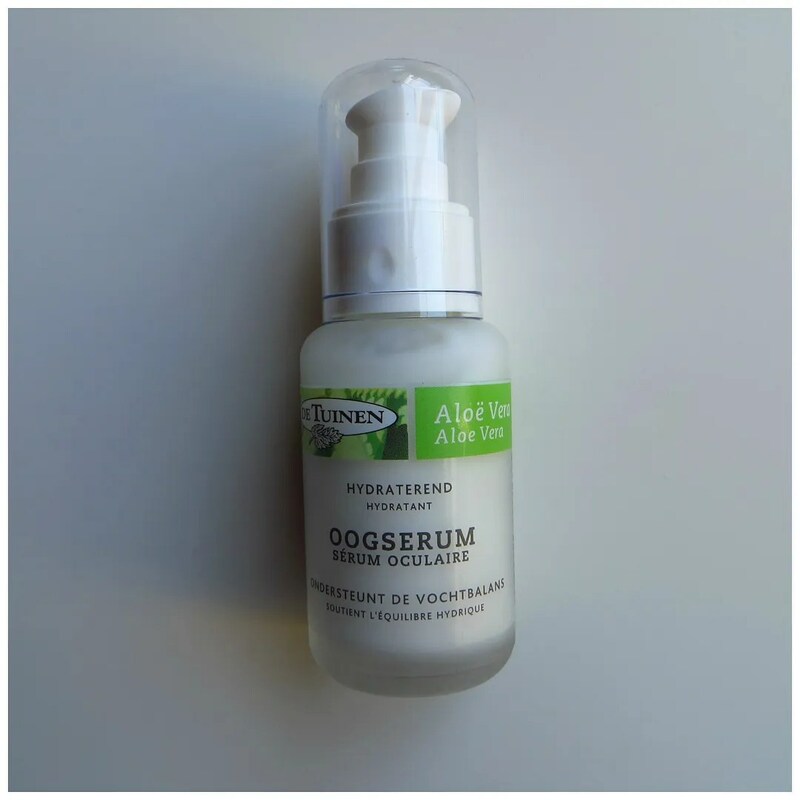 On the bottle you can find the information that this eye serum is supposed to support the amount of moisture present in your skin. To me it seemed like a good, basic eye serum and as long as it hydrates my eye area, I’d be happy. Packaging wise, I think this serum also comes up trumps. It comes in a glass, matte bottle that is equipped with a pump. The plastic cap did break on me quite quickly, but that also happens to me for other skincare products with similar packaging. Inside you can see a milky white substance and because of the clear sticker it is easy to see how much product is left. So bonus points for packaging! (INCI ) : Aqua, Aloe Barbadensis, Pentylene Glycol, Glyceryl Stearate, Butyrospermum Parkii, Ethylhexyl Stearate, Paraffinum Liquidum, Ceteareth-20, Centaurea Cyanus, Dimethicone, Cetearyl Alcohol, Ceteareth-12, Cetyl Palmitate, Triethanolamine, Allantoin, Carbomer, Parfum, Trisodium EDTA, Benzyl Salicylate, Hexyl Cinnamal, Linalool, Coumarin, Citronellol, Hydroxycitronellal, Alpha-isomethyl Ionone, Butylphenyl Methylpropional, Isoeugenol, Benzyl Alcohol, Geraniol, Hydroxyisohexyl 3-Cyclohexene Carboxaldehyde, Eugenol, Benzyl Benzoate, Limonene, Amyl Cinnamal, Evernia Prunastri Extract, Citral, Benzyl Cinnamate, Farnesol, P-Anisic Acid. 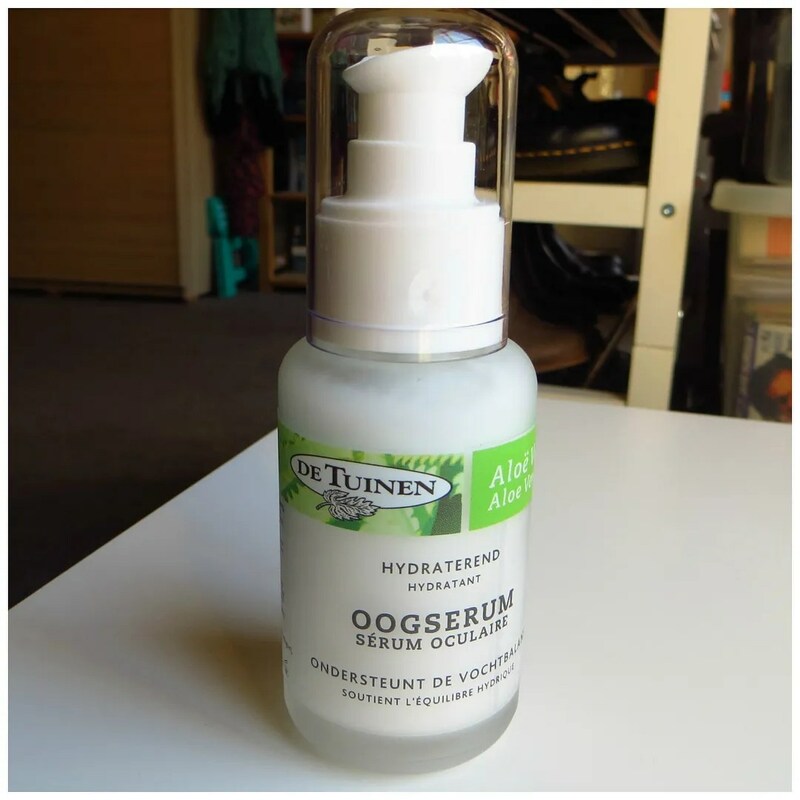 According to De Tuinen, this eye serum should hydrate and moisturize the eye area. Aloe Vera juice has healing properties, contains vitamins, and is both soothing and hydrating. This product should be used once or twice a day by tapping it gently into the skin. It is recommended for all skin types. Ingredient wise this product is free of colors and preservatives. The main ingredient is water, followed by aloe vera juice. I also recognize shea butter at the top of the list before it turns into a whole lot of abracadabra. I see perfume, different types of alcohol (but from what I can tell they’re the good kinds) and some other acids, silicones and extracts. A long list that doesn’t tell me much, but if it works, it works I guess. The product has a very watery and runny consistency. That was a surprise when I first used it! It skirts out and runs everywhere, so don’t be too enthusiastic when you use this because it can easily get messy. But once you get the hang of it, it is fine. 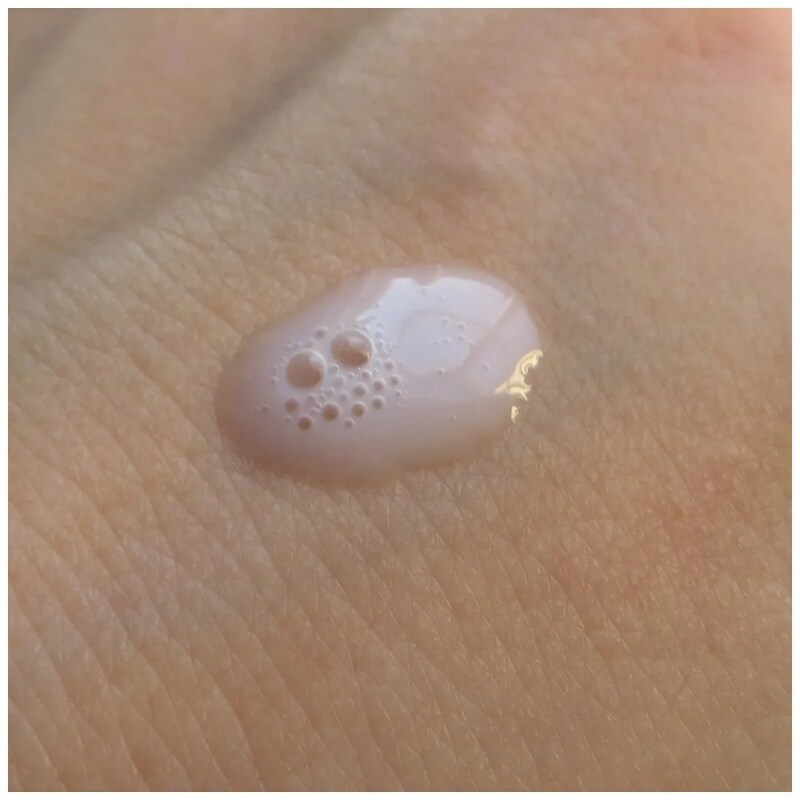 I use about half a pump on my finger tips, spread it and then gently apply it to my under eye area. What’s left I spread onto my lids and brow bone. I have only used this as part of my night time routine, so I am not judging this on how well it works under make up. It smells really nice. It’s a clean, fresh smell and despite the long ingredient list my sensitive, dehydrated skin loves this stuff. After using the TBS eye concentrate for a while I started noticing some fine lines caused my the dehydrating properties of that product. By now I’ve been using this eye serum for 2 months or so and those fine lines have disappeared again. So does this deliver on its main promise that it’s a hydrating and soothing product? Yes it does! In fact, I have been eying up the deal they have on now, to buy myself a back up. However, seeing there are 50 mls in this bottle and I have only made a small dent so far, I think that by the time I run out of this, it will have been on sale 10 times over. I highly recommend trying this eye serum if you are looking for a hydrating eye cream that gets the job done. Do you use an eye cream? And if so, which one? I think I might give this a try! My eyes are making me suffer so badly at the moment and I haven’t found the right product yet – i’m just so sensitive to everything! At just over 5 euros this product is a steal and worth a shot. Good luck! Yep ik kan hem echt aanraden, anders is TBS ook nog de moeite waard. De Nutriganics oogcreme is wel prijzig maar werkt fijn en doe je lang mee.